Helen Thomas, Former Dean Of White House Press, Dies At 92 : The Two-Way Thomas, who spent decades at the White House reporting for United Press International and later Hearst Newspapers, covered every president from Eisenhower to Obama. 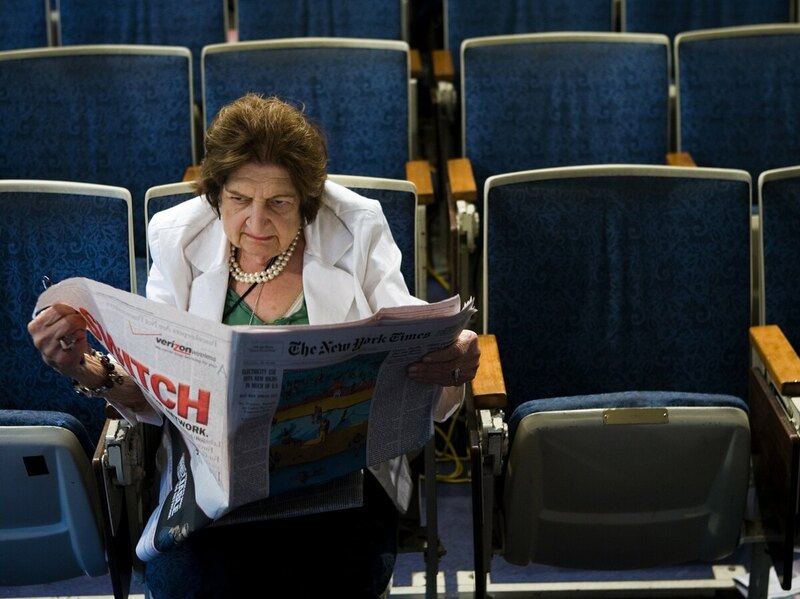 Helen Thomas reads the newspaper while sitting in her chair in the White House press room in 2006. She died on Saturday at age 92. Long-time White House correspondent Helen Thomas, who covered every president from Eisenhower to Obama, has died at age 92, according to The Gridiron Club & Foundation. Thomas, who spent much of her career at United Press International before switching in her last decade in journalism to Hearst Newspapers as a columnist, died Saturday morning at her Washington apartment after a long illness, according to the Gridiron Club, where Thomas was the first female member and a former president. Her longevity at the White House gave Thomas a coveted front row seat at briefings and allowed her, as the senior wire-service reporter, the first question at presidential news conferences. That ended when she left UPI in 2000. NPR's David Folkenflik reports that the sometimes controversial journalist "broke barriers that prevented women from rising in the Washington press corps." Thomas was born to Lebanese immigrants of little means and grew up in Michigan. She attended Wayne State University before heading to the nation's capital as a copygirl for the now-defunct Washington Daily News. She covered women's issues, but held onto the White House beat for UPI, staying for decades. "Presidents grew to respect, even to like, Ms. Thomas for her forthrightness and stamina, which sustained her well after the age at which most people had settled into retirement. President Bill Clinton gave her a cake on Aug. 4, 1997, her 77th birthday. Twelve years later, President Obama gave her cupcakes for her 89th. At his first news conference in February 2009, Mr. Obama called on her, saying: "Helen, I'm excited. This is my inaugural moment." NPR's Folkenflik says that "over time, her largely left-of-center views became more pronounced." But in an appearance on NPR's Talk of the Nation in Aug. 1999, she defended the White House press against accusations that it had gone too far in pursuing the Monica Lewinksy scandal that led to President Bill Clinton's impeachment. "Well, I know we're being accused of overkill, but I think that the aggression [comes] in the aftermath of being lied to for nine months," she said. "A certain disillusionment does set in, and we all realize that we were not aggressive enough. We didn't ask enough questions." At age 89, after decades covering Washington presidential politics, Thomas' career finally unraveled when she was interviewed on the White House lawn by RabbiLive.com. Asked for her comments on Israel, she replied: "Tell them to get the hell out of Palestine." The remark touched off a firestorm and Hearst dropped her shortly thereafter. "Helen Thomas was a trailblazer in journalism and in the White House press corps, covering presidents from John F. Kennedy through Barack Obama. "Starting with the Kennedy administration, she was the first woman to cover the president and not just the First Lady. "At her urging in 1962, Kennedy said he would not attend the annual dinner of the White House Correspondents Association unless it was opened to women for the first time. It was. "And in 1975-76, she served as the first woman president of the association. "Women and men who've followed in the press corps all owe a debt of gratitude for the work Helen did and the doors she opened. All of our journalism is the better for it."